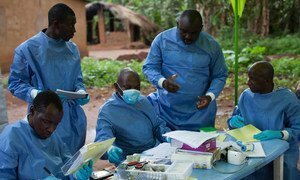 An Ebola outbreak in north-eastern Democratic Republic of the Congo (DRC) has killed at least one person, the United Nations World health Organization (WHO) announced earlier today. “An investigation team led by the Ministry of Health and supported by WHO and partners has deployed and is expected to reach the affected area in the coming days,” said WHO Executive Director for Emergencies Peter Salama in a news release on the situation. According to WHO, the country's health minister requested the UN agency's support after one of five blood specimens tested positive for the Ebola virus disease. On 9 May, WHO was informed of a cluster of undiagnosed illness and deaths, including haemorrhagic symptoms in Likati Health Zone, Bas Uele Province, some 1,300 kilometres (about 800 miles) from the Congolese capital, Kinshasa, and bordering the Central African Republic (CAR). Since 22 April, nine suspected cases, including three deaths, have been reported. Six cases are currently hospitalized. “The Likati health district is in a remote area, but contact tracing is essential to contain the epidemic in its focus; the DRC can rely on very experienced health workers for this purpose,” said WHO's DRC Representative, Yokouidé Allarangar. Matshidiso Moeti, WHO Regional Director for Africa, would arrive in Kinshasa this weekend to attend a coordination meeting of the national committee at the Ministry of Health to deal with this emergency and ensure that WHO provides all necessary assistance to the DRC. WHO has also drawn up a comprehensive logistics plan to meet urgent requirements. The first teams of epidemiologists, biologists, and experts in the areas of social mobilization, risk communication and community engagement, and also personnel specializing in water, hygiene and sanitation, are scheduled to reach the affected area today or tomorrow via Kisangani. More than 11,000 people died and some 28,000 cases were reported in the Ebola outbreak in West Africa in 2014-2015, mainly in Guinea, Sierra Leone and Liberia.